Not so long ago, I finished porting the JChemPaint-Primary branch to be a patch on top of CDK master from our git repository. This means frequent rebasing, to incorporate the latest changes in the CDK master branch. Today, I did such a rebase, after the CDK 1.3.0 release. Hoping that at least some find this informative, this is what I did. Remember, that the patch is organized around the render and control modules, which is why we have so many branches, while merely in linear relationship. Not that the last two weeks has seen a boost on blog submissions to Chemical blogspace; just that I was not really finished with New Blogs #10. ELN vendor: "The Open Source stuff just works better"
We use a lot of Open Source components in our products, and I know we’re not alone. 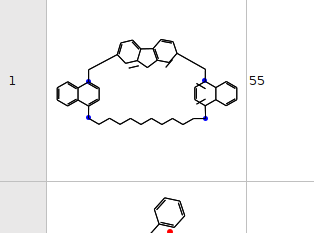 I am not sure if this involves open source cheminformatics, but asked about that... the whole article is worth reading. 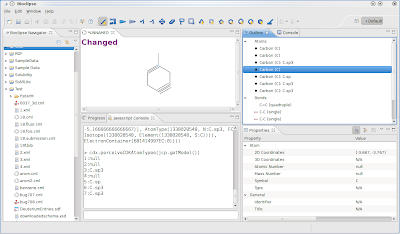 Following the CDK and JChemPaint Primary, Bioclipe moved to Git just after the 2.0.0 release. Several plugins are still in the SVN world, but a good deal is now Git-ready. BTW, this move also adds several new accounts to watch on GitHub (see Rich' 17 GitHub accounts to watch on Cheminformatics). The splitting up, was rather interesting indeed. We wanted to keep the complete commit history, but still reduce the git repositories considerably. This means removing history of the plugins which should not end up in the repository. Git allows this! Git rules! This time, git filter-branch is our friend and there are basically two options: constructive and destructive. The first copied bit by bit plugins from the old to the new repository. The second one does the opposite, and removed bit by bit stuff you do not want. Depending on the ratio of plugins you want to keep and those you want to remove, either solution is more appropriate. 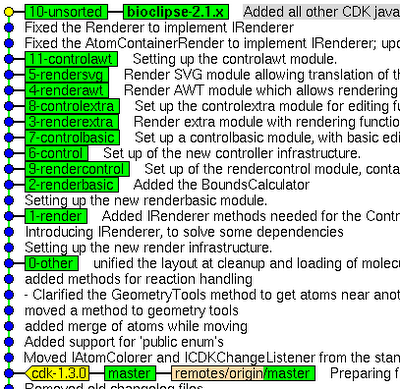 I have summarized the git commands I used in detail on this Bioclipse wiki page. As you can see (when you click on the image to enlarge it), I have more or less finished the first drafts of the patch sets (see this wiki page) 0-other, 1-render, 2-renderbasic, 9-rendercontrol, and 6-control. The last one does not actually compile properly yet, as I need to abstract an IRenderer interface first. There are several patch sets that I am still porting, but I hope to finish that this week, after which I'll continue working on the new IEdit framework in the controller modules recently set up by Arvid. It will take some time before these patches actually get submitted for review, as there is quite some PMD, DocCheck and unit testing work to be done, as is clear from the Nightly running on the SVN branch. Finally, I like to note that this git repository collapses a lot of work done by developers at both Uppsala University (Arvid, Ola and me) and the EBI (Gilleain, Stefan and now Mark). While the above git history will not reflect those contributions, you can recover this information from the copyright headers. I also like to thank Lars and Sam for their valuable testing! 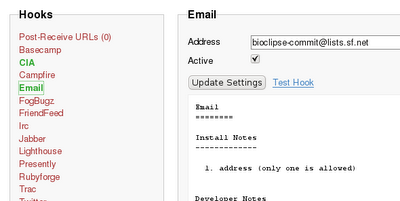 The MDL molfile for structure 55 is available from the bug report I filed against Bioclipse.